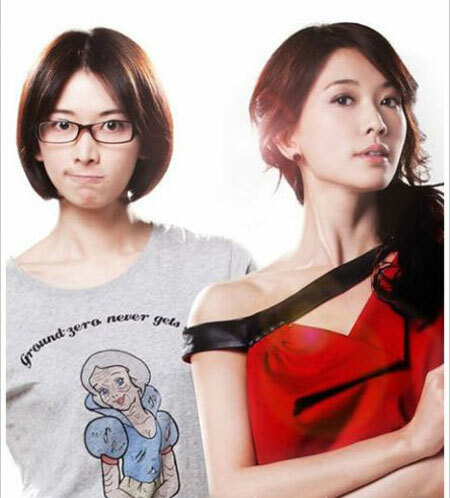 Li Xiaohong and Mo Xiaoqing are gorgeous twins, both played by model/actress Lin Zhi-Ling. Their parents divorced when they were young, hence the different surnames. Since it’s assumed that the audience can’t ever tell twins apart unless there are some drastic differences, there’s the typical dichotomy, with one twin (Li Xiaohong) being flirtatious and the typical “bad girl” while the other twin (Mo Xiaoqing) as the studious, serious ‘nerd’. They have very different viewpoints on love (at first), as Xiaohong doesn’t believe in love…she only believes in money while sister Xiaoqing believes in true love (excuse my cynical self as I throw up). While she gapes, she notices that he pulls out a shiny black credit card (apparently it has no limit), and you can almost hear the gears whirring in her head. Sadly, she does not eat any of the food (what a waste!) and hurries to work, much to Zhang Quan’s disappointment. Poor puppy. As for Xiaoqing, she’s been living with her high school boyfriend for…..a long time, and he sheepishly tells her that he put their house down as security for his friend’s loan. She throws various items at him, and he threatens to jump off the balcony…she taunts him….he falls….and he breaks his leg. How old are they again? So now she has to take care of the guy, even though they technically broke up. While bathing him, she gets a call for an interview, and ditches him in a flash. She shows up at the company, and finds that Xiaohong works there. Surprise! Xiaohong decides it’s time for the sisters to bond, and takes Xiaoqing to her classy, albeit messy house. They exchange dating philosophies and Xiaohong takes Xiaoqing out for a makeover. They go to the company party for Xiaoqing’s debut, and Xiaoqing meets a wealthy, successful man who is socially awkward around girls and has OCD. They hit it off, as Xiaoqing also has a penchant for things being straight and orderly. Xiaohong encourages the two to date. Xiaohong dates Zhang Quan, though to be more accurate, you could say that she’s dating his credit card. She doesn’t try to hide her intentions, and tells him that she only loves his money. He is unfazed, because he’s in love with her. During one of the dates, he proposes with a ring that he made himself. Like a true materialistic girl, she tells him that she wants a huge diamond. They later go to his house to have dinner, where she meets his dysfunctional family. When they retreat to the peace of his room, he reveals that he likes to tinker with metal and such, because people only see him for his money (i.e. his friends only call him when they need to pay the bill). This is the part I don’t really get, because she’s obviously only spending time with him to spend his money. But then he proposes with a diamond….only to get her rejection. She repeatedly stresses that she’s only in love with his money, that their relationship isn’t serious, that she doesn’t love him, while he just sadly says that he loves her. They part ways to cry by themselves. While Xiaoqing goes on a few dates with Mr. OCD, she discovers that she misses her old boyfriend. They were comfortable around each other, even though they didn’t have a mountain of money. Insert a lot of crying and breaking up and making up, because I’m too lazy to go into all the typical drama in detail. Xiaohong realizes that she’s fallen in love with Zhang Quan, and heads over to his house to ask if the proposal is still valid. She asks him to list her weaknesses, and he actually makes a long list, including selfish, messy, and bad at choosing restaurants. But he loves her all the same. Before the wedding, he picks up her phone call when she is busy fitting into her wedding dress. Hearing the voice of her old boyfriend telling her that he divorced his wife for her, he assumes the worst and runs out of the tent. Hearing the last part of the conversation, Xiaohong rushes out, in full wedding gear, and tries to stop him. Like the amazing heroine that all heroines should be, she literally leaps on top of him when he refuses to listen to her. After her explanation that she had rejected the man and reaffirming her love for him, the two make up and decide they want to get married now. This is my favorite part. In most dramas, someone is always holding back, reluctant to give the relationship a final push. She could’ve let him go, she could’ve just stood there and cried…but she didn’t. When she jumped on top of him, I was bouncing in my chair. That’s my girl! It’s a move that we should apply in real life: take the chance, give it your all, and create your own happy ending. In the end, Xiaohong is pregnant, still using Zhang Quan’s all-powerful credit card, while Xiaoqing is back with her old boyfriend. This entry was posted in Movies and tagged Chen Kun, Lin Zhi-Ling, Love on Credit, 幸福额度. Bookmark the permalink.